Whether you are making a Jedi robe, Hobbit cloak, Mistcloak, Handmaiden robe, or a hooded cowl worthy of Death Himself, you need to make an epic hood. There's nothing more pathetic than a cloak with a dinky little hood that looks like it came off a hoodie. Am I right? Well the good news is, it is SUPER EASY to make a really cool hood. You don't even need a pattern! 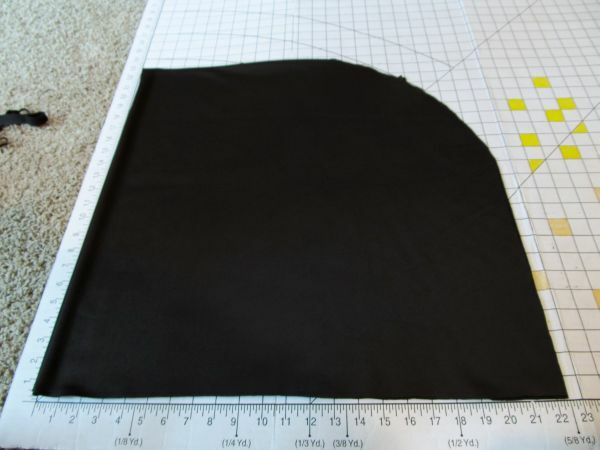 - Interfacing (sew-in, thick stuff like for lapels and collars) - a strip about 3" x 12"
Step 1: Make a Square! This hood will use the fabric as the lining as well. If you want lining, cut two rectangles, then sew them together to make a 45" x 45" square. If it's a 40" x 40" it should be fine. I like to start big because it is very easy to trim it down if your hood ends up too big, but the original version of this pattern used 50" x 50" and I found that to be ridiculously large. For a kiddie cloak you just need to start with a smaller square, or do a lot of trimming! Fold your fabric square in half, keeping the good side of your fabric on the inside. With chalk, draw a X on the top piece of fabric (on the wrong side of the fabric) - this side is your "lining". If you used a different lining fabric, your first fold should be on the sewn line separating the two fabrics. Lay the fabric with the lining on top and fabric on bottom with the right sides of both fabrics inside. Now fold the rectangle of fabric in half again, creating a square. Now your "lining" will be on the outside and your "fabric" will be on the inside. Step 3: Orient yourself and make a curve. Look at your fabric square. One edge will have one fold - this is the "top" of the hood. Orient your square so the side with one fold is farthest from where you are sitting (or standing). The other two edges of your square will be the selvages or raw edges of the fabric. The side closest to you - opposite the "top" of the hood - is the bottom edge which will eventually be attached to your cloak. You can clip small notches on this side if it helps you orient yourself. The side on your right is the "back" of the hood. This is the side that we need to sew. 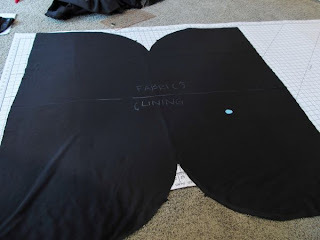 Using chalk, draw a rounded curve to indicate your sewing line, starting in the top center, curving the upper right corner (upper back) of the hood, and continuing straight down an inch from the right side to leave a 1-inch seam allowance. 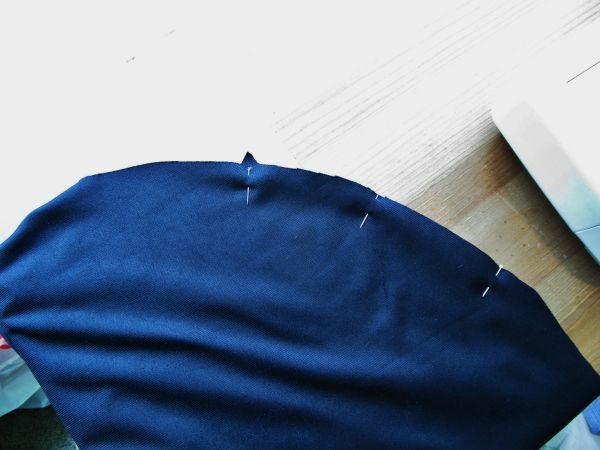 Trim the excess fabric and add a notch in the middle of the curve to help when you need to pin prior to sewing. I like to add interfacing into the front of the hood in order to give it a stiffer curve over my face. This step is optional. Make sure you add the piece of interfacing to the lining so your stitches do not show. 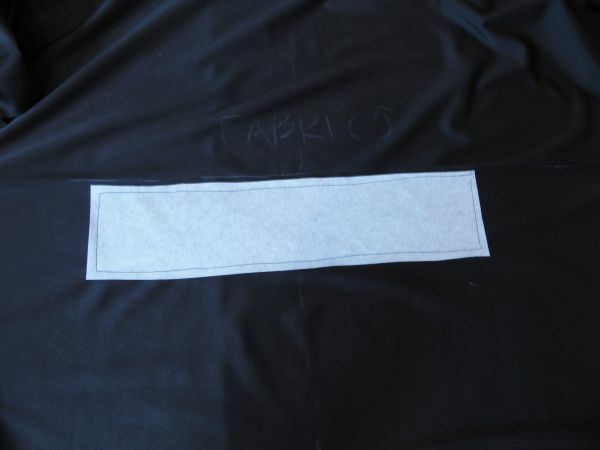 The interfacing piece should be placed in the center of the fabric on the lining side below the center fold line. Fold the fabric in half down the middle (fabric to fabric, lining to lining). Pin the layers together and sew both curves. Remember to start in the top center - do no sew the entire top edge, but you WILL sew the entire back edge. Press your seams open after sewing, then flip the hood right-side-out. Press the front edge of your hood, then try it on! Now is the time to resize it if it is too big. Just sew a new curve inside the curve you already created. Now you can attach your hood to your cloak! If the bottom edge of the hood is longer than the top neckline of your cloak, simply add symmetrical pleats on both sides of the hood (I usually keep the pleats along the back). the back of my finished Mistcloak. If your cloak does not have lining, you can create a wide piece of biase tape from the remnants of your cloak fabric, double-fold it and use it to cover the rough edge of the seam between your hood and cloak neckline, otherwise it will show when your hood is down. 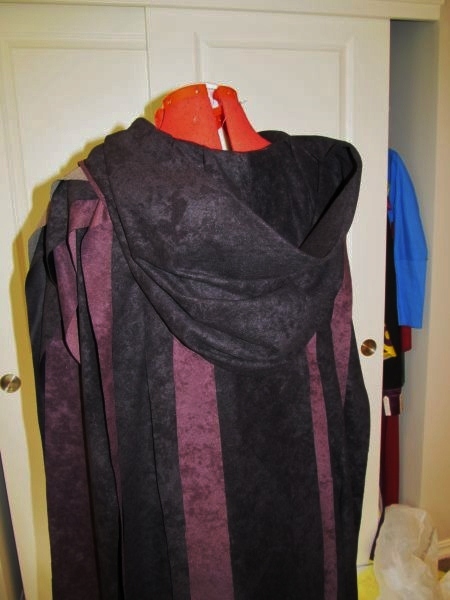 I have used this hood-making method for my Barriss Offee Jedi cloak, my Mistcloak and Handmaiden cloak. This is a proven method that totally works! Go try it! No, I made a lot of my costumes prior to starting this blog. All of the cloaks are epic! Thanks! Thank you for showing me the way to make a generous hood. Your explanations are so easy to understand. Happy smile! Thank you very much for posting these simple hood-making instructions. I'm also looking for a very basic pattern for a cloak/robe with bell sleeves that are not cut out an sewn on (like shirt sleeves are). The kind of pattern that you draw out in the shape of your body, including the bell sleeves, with a cut-out for the neck. This is beginner-level sewing, I realize, but it has to be easy for a class. thank you for any information or leeds you can provide. Thank you so much for this great easy to follow pattern. If I needed the hood only how would I do the bottom to wrap around the neck only... ?